The motor unit is so small that people will barely notice the motor mounted to the bicycle. It weighs only ~950gr ! The motor can be fully disengaged to guarantee no braking forces what so ever in the normal bicycle mode. 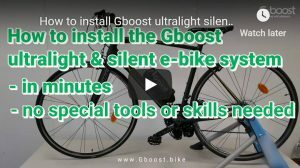 So you can continue to use your Gboost-ebike without motor assistance also as a normal bicycle. Or you can keep it engaged to re-charge your battery when rolling downhill and also use less your breaks. one screw only to fix the motor & control unit. 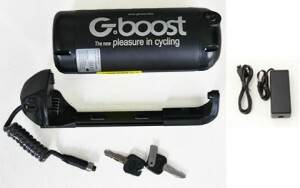 To survive the daily use, especially in wet and dirt conditions, the Gboost motor is a real closed design. Dirt and water will cause no damage or corrosion. All connectors a sealed, too. The bearings, one on each side, are over-seized to take the tire pressure loads to ensure for a long live. Thanks to our special designed control technology, there are no external sensors or hall sensors needed. 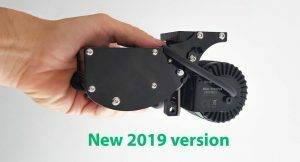 Our Gboost V2 was sold over 1000 units in Decathlon stores, with an exceptional low failure rate and still running strong, thus of their fully closed design. The newest engine technology paired with our internal damping makes the Gboost is so quiet that bystanders cannot hear whether you are driving with or without engine assistance. 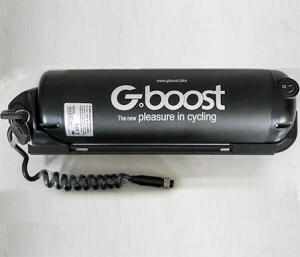 GBoost is still the only really silent friction drive in the market, you can buy today. Thanks to the the integrated pedal assist sensor (patent pending), just stick a tiny magnet to the pedal crank, save time and forget it forever. There is no more need to install a classic pedal assist sensor and the ugly magnet disk as well. This also often caused installation challenges in the past, thus in many modern pedals systems is not enough space for the magnet disk. The old classic external sensors often fail, either because so sensitive to the position (+-2mm). And the newer wireless external sensors, often run out of their battery or even have disturbed wireless connections in some areas. We used this solutions in the past… not anymore. To avoid the slipping of the motor, a patented pressure regulation assures that there is just enough pressure of the motor onto the tire, so it is not slipping (also in wet conditions). The motor should also not press too much and deform the tire, thus this would waste energy. This regulation mechanism also compensates for less tire air pressure or not perfectly round turning wheels. (Which is not so rare in real day to day usage of bicycles). One more thing, for the geeks… : The pressure regulation is also responsible that we have unbeaten efficiency among friction drive systems, even outperforming many classic e-bike systems. And better efficiency means, you will get more range with the same battery. With the Bluetooth LE capabilites you can connect the Gboost controller to your phone. So you can adjust via sliders the speed and power limits for each of the 5 assistance modes. As well other features eg. anti-theft, kids-mode and more to come via software upgrades. Light weight battery with high performance last generation Panasonic lithium cells, in low key bottle form. 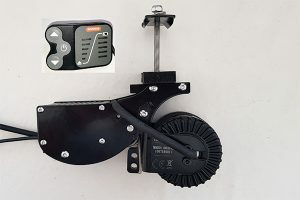 The battery holder is easy to mount on any bike frame, with just 2 screws at the holes for the drink bottle or if not available with 2 clamps at any place. 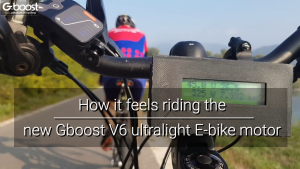 **based on a realistic 5Wh/km at continous usage in normal assistance mode on a flat surface, it will be less at high power- and high speed modes, your range depends also on your weight and your cycling style as well tires etc. Interested in upgrading your bike?